Biking Group: Rides are taken on local trails and occasional longer rides are made in Raleigh or out of state. 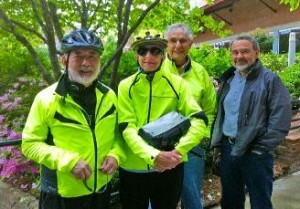 The group meets weekly on Monday mornings, at various times, depending on the weather. Hiking Group: Weekly hikes are taken on local walk-to trails as well as on a few trails requiring a bit of a drive. The group meets every Wednesday morning at various times depending on the weather. Strollers: This is a shorter distance and slower paced walking group than the Hiking Group. The group walks on Saturday mornings. Mah Jongg: Three groups play Mah Jongg every week. 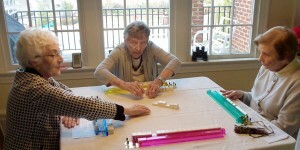 One group plays o Monday evenings from 7-9 p.m. and two groups play on Tuesday afternoons, one from 1:00-3:00 p.m. and the other from 2:00-4:00 p.m. All games are played in participants’ homes. Training for interested members is available. Movie Group: Meets approximately once or twice a month depending on the movies available. The leader(s) selects the movie. Pickleball: This group plays on various days and times during the week. Contact the coordinator for more information. Port-A-Pub: A Monthly social event which occurs the second Friday of each month, from 5:30- 7:30 p.m., hosted by MAPP members in their home. Luncheonettes: Meets monthly, on the third Thursday, at a local restaurant. A different venue is selected each month. 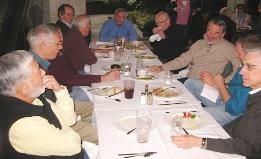 Men’s Lunch Group: Meets monthly on the first Tuesday of the month, at 11:45, at a local restaurant. A different venue is selected each month. Speakers Series on Aging: MAPP sponsors and this is coordinated with the UNC Wellness center. Held monthly on the third Thursday of each month from 4-5 p.m. at the Wellness Center. Wineaux: A monthly drop-in social event held at Marriott Courtyard lounge, on the fourth Wednesday of each month from 5:30-7:00 p.m.
MAPP Board: Volunteer to run for election and serve on the MAPP Board of Directors. Annual Holiday Party: Offer to host the event and/or to help plan and organize this annual party. Annual Picnic: Offer to host the event or to help plan and organize this annual event. Membership: Lead or assist in the responsibilities for managing membership. Monthly Newsletter: MAPP Musings: Suggest, obtain or write articles for each issue. These are then passed on to the Editor for publication. Port-A-Pub: Volunteer to host one of the monthly events or offer to be a co-host. Speakers Series: Suggest or arrange for future monthly speakers.